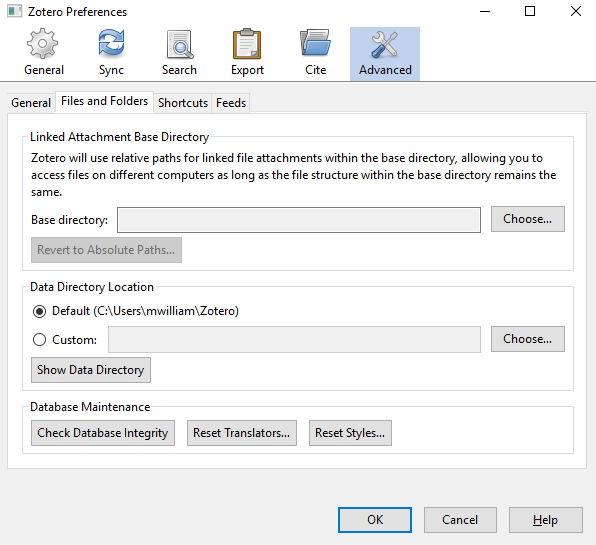 After installing Zotero Standalone for Windows, each user will need to first create their Data directory. very quickly, filling the User Profile. 1. Launch Zotero Desktop Application. 2. You may be prompted that the Data directory was not found. If so, choose ‘Create Directory in Default Location’. 3. Under the ‘Edit’ tab, select ‘Preferences’. 4. Select the ‘Advanced’ tab, and then select the ‘Files and Folders’ tab. 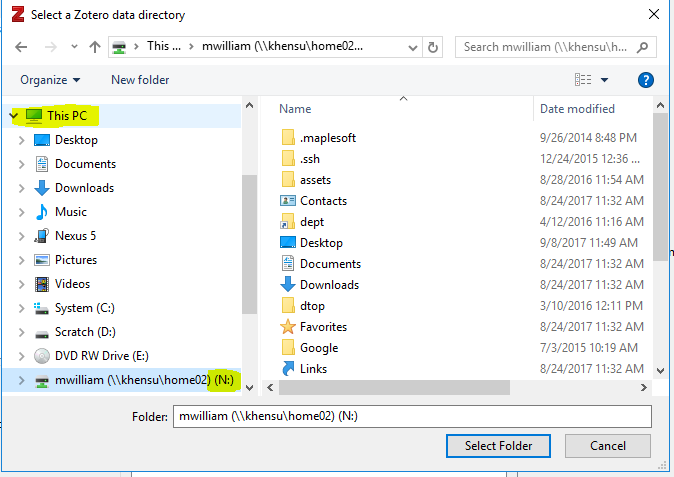 this will open Windows Explorer inside Data directory in your User Profile. 6. Navigate up one folder directory by clicking the up arrow. 7. 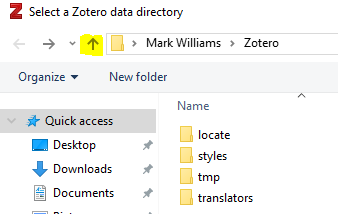 Right click and copy the ‘Zotero’ Data directory folder from the profile location. 8. Navigate to your N: drive by clicking the > next to ‘This PC’ and then the N: drive. 9. 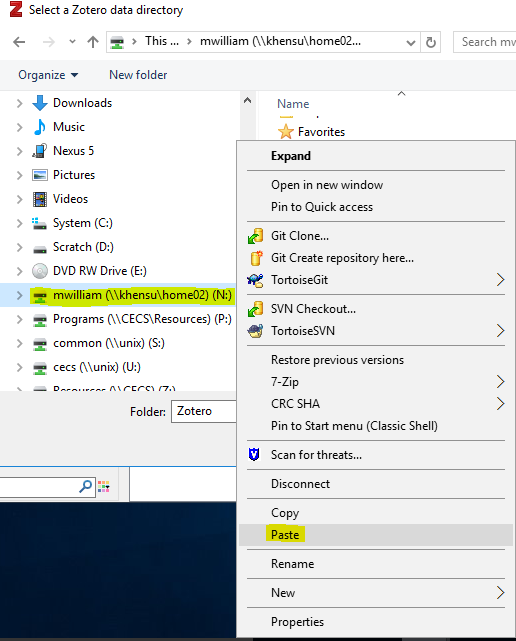 Then right click on the N: drive and paste the copied folder in this location. 11. 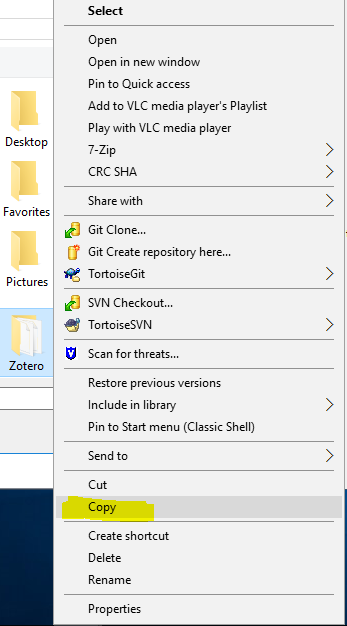 Navigate back the C:\Users\your-username and delete the old Zotero folder. 2. Go to tools, and select add-ons. 3. 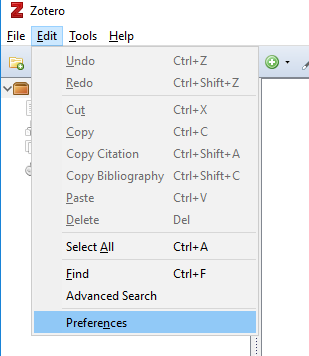 Select options on Zotero. 5. Under Data Directory, use custom to change where it is stored. You will want to select a place that is located in your N://, like My Documents, and then use Make New Folder to make the new location. 6. Once this is done, you will need to open up your profile, and manually move the existing Zotero information into the new Zotero location. Once you have moved your files, you can delete the copy that lives in your profile.